Established in 1992, the Addameer (Arabic for conscience) Prisoners Support and Human Rights Association helps Palestinian prisoners, and works to end torture, arbitrary arrests and detentions, other forms of abuse, and unjust, unequal treatment in Israel’s criminal justice system that handles Jews one way and Palestinians another. In July 2009, in cooperation with the Grassroots Palestinian Anti-Apartheid Wall Campaign (Stop the Wall) and the Palestinian Prisoners Support and Human Rights Association, Addameer published a report titled “Repression allowed, Resistance denied” that documents resistance to Israel’s apartheid wall and the “staggering level of repression, arrests and violence” by Israeli authorities. On July 9, 2004 in a unanimous decision, the International Court of Justice (IJC) ruled that “the construction of the Wall being built by Israel, and its associated regime, are contrary to international law….” It said construction on it must cease. Built sections must be dismantled, Palestinian land returned, and compensation paid for property destroyed. The UN General Assembly endorsed the decision. Israel rejected it out of hand, keeps seizing Palestinian land, continues the wall’s construction, and ruthlessly suppresses efforts to halt it. In defiance of international law, Israel’s High Court ruled that erection of a “barrier” may continue for security reasons even though its purpose is solely to steal resources and land that will include over 12% of the West Bank when completed. The consequences for Palestinians have been devastating. Communities have been divided, isolated and ghettoized. Farmers have been separated from their land and water sources. Militarized control is repressive, and free movement is more restricted than ever. “Restrictions on the Palestinian right to freedom of movement are endemic in the West Bank, stemming from Israel’s control of checkpoints and crossings, impediments created by the Wall and its crossing points.” They constitute an illegal matrix of control affecting all aspects of Palestinians’ lives. Popular non-violent, direct action resistance emerged in self-defense as well as lobbying through the courts and national and international media campaigns. It was entirely blacked out in the major media. Most visible are weekly demonstrations, protests and marches involving Palestinians, Israelis, other Jews, and international human rights activists – in defiance of Israeli military orders that call these activities and all organized resistance “criminal offenses,” punishable by arbitrary arrests, targeted killings, brutal repression, disproportionate violence, and collective punishment in violation of international law, including Fourth Geneva protections. — Palestinians victimized by decades of unremitting, systemic violence and repression, and in Gaza under siege and attack, of course, it’s much worse. When completed, it will span over 760 kilometers, be more than five times longer than the Berlin Wall, and far more imposing with its sensors, trenches, security roads, mine fields, checkpoints, terminals, watchtowers, surveillance cameras, electronic sensory devices, and military patrols using killer dogs. Around 20% of the Wall follows the “Green Line.” The rest expropriates over 12% of the West Bank and East Jerusalem, and with the settlements, military zones, and for-Jews only infrastructure amounts to about 46% of the Territory and growing as Israel keeps seizing more land. It displaces thousands of Palestinian families, entraps all Palestinians in the West Bank, steals their land and resources, and has nothing to do with security. It’s a land grab/collective punishment scheme to enclose an entire people inside disconnected cantons in violation of international law and the ICJ ruling. In October 2002, opposition groups were formed, including the Grassroots Anti-Apartheid Wall Campaign (Stop the Wall) in response to a need for a coordinated popular resistance and to offer advocacy, research, legal challenges, and support for the communities affected. Efforts thereafter grew, and from September 2003 became a national and international priority. Israel responded with permit restrictions to bar free movement and prevent people from accessing their lands. Since then, many anti-Wall farmers lost their livelihoods when they were denied permits to cultivate their own land. Demonstrations, protests and strikes have continued in targeted West Bank communities and villages. Campaigns not to recognize the permit system were organized. Israeli forces responded harshly. Time passed. Crops rotted in fields and livelihoods were destroyed. Yet villagers resisted despite severe collective punishment imposed. Since then, eight West Bank popular committees have been represented in the Campaign’s General Assembly, and five of the 11 members of the Campaign’s coordinating committee are representatives from local groups. In 2004, anti-Wall resistance became widespread. The first martyrs were killed in defending their rights. The ICJ ruled the Wall illegal and ordered its demolition. Increased land theft and human fallout drew international attention and encouraged mass protests and solidarity against state-sponsored terror. Direct actions blocked bulldozers, breached sections of fences and razor wire separating villagers from their lands, slowing construction and forcing constant rebuilding. Media strategies were also developed through international contacts. In addition, committees held rallies, demonstrations, and sit-ins to pressure the Palestinian National Authority (PA) to support affected communities, raise the Wall issue at an international level, and act to implement the ICJ decision. 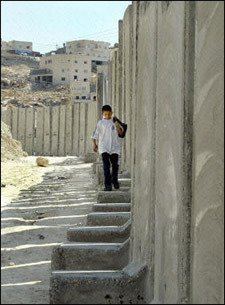 Yet when UN Secretary-General Kofi Annan came to Palestine in March 2005, he refused to speak out or visit the Wall. Around 5,000 Palestinians demonstrated in protest. Since late 2005, popular resistance had to reorganize for numerous reasons. So much of the Wall was completed that actions to stop bulldozers ceased. Since international support failed to materialize, new forms of protest were needed to sustain a long-term struggle. Friday demonstrations replaced daily ones so a semblance of daily life was possible. Yet in areas like Anata in East Jerusalem, daily protests continued because Wall construction ran straight through school courtyards. Students were involved and sustained many injuries for their efforts. Frustration with the Palestinian leadership also grew as campaigning for the Palestinian Legislative Council (PLC) began in late 2005. It heightened the split between Fatah and Hamas because effective popular resistance was futile without leadership sustaining and capitalizing on it. National actions like Land Day, the Week against the Apartheid Wall, and other events gained prominence. In March 2007, Land Day activities took place in over 20 locations with popular committees and students participating. Thereafter, Stop the Wall and popular committees have been key players in other national action days. Resistance solidified and expanded south with new campaigns against Wall construction. People in the Jordan Valley protested against being isolated from the rest of the West Bank. Media and civil society organizations finally noticed, and political and material support began to arrive. Since mid-2008, weekly protests gained strength in a number of villages – in Bil’in, Al Ma’sara, Irtas, Ni’lin, Jayyus, Nahalin, and elsewhere with hundreds of people facing down soldiers and risking arrests, injuries or death. In addition, popular committees are focusing on settlements and renaming themselves “Committees Against the Wall and The Settlements” because both represent occupation leaving Palestinians dispossessed, walled-in, ghettoized, and repressed unless organized movements resist. The villages of Burqa, Bizzariya, Silat, ad-Dhahr, Sabastiya, and Beit Imrin led protests against the resettlement of Homesh, a settlement evacuated during the “disengagement.” After a month, Homesh settlers left with all their belongings. Other actions included boycotting Israeli products and legally challenging companies that support the Wall and occupation. “The mobilizing capacity of the popular committees and Stop the Wall (have) become (key) actor(s) at national action days, such as Land Day and the 60 years Nakba Commemoration.” During Operation Cast Lead, they sacrificed two lives in supporting Gazans under attack. Movements against the Wall have become a “politically mature network of activism and resistance” despite escalated repression against them. — entire villages targeted with collective punishment, including mass arrests and unconscionable viciousness. “They kidnapped a 16 year old boy (Mohsen Kateb)….and took him away into the night. Haitham al-Katib, a respected Palestinian activist….was video taping….when soldiers aggressively pushed him against a wall and threatened him with arrest…..(the son of) Iyad Burant, the head of the popular committee, (was threatened) if he didn’t produce a camera….This raid follows on the heels of others that have happened almost every night for two weeks.” Arrests are made and people threatened because they campaign against the “loss of 60% of (their) farmland due to the construction of the apartheid wall and the illegal settlements” that continue to expand. Israeli policy focuses on ruthless deterrence to break popular resistance by inflicting serious harm. Threats are made collectively and against village officials. Violence is systemically employed. Activists are threatened, killed or arrested. Live fire is used against peaceful demonstrators. One popular committee member said: “once, soldiers broke into my home and told my mother that if her son did not stop, they would break his legs and he would never walk again.” Others recounted death threats. Parents are told “we are going to take revenge on you and on your children.” Leaflets are distributed promising “punishment (and) final warnings” to communities that keep protesting. Home demolitions are also threatened. Farmers are told their land and crops will be destroyed. Force follows, including beatings, live fire, tear-gassing, willful killings, including against children. Soldiers justify it as “crowd (or) riot control” and that soldiers fire only in self-defense. In fact, actions are grossly excessive against activists and peaceful demonstrations, and include ambushes, shootings from rooftops and concealed locations, and extreme aggression against a civilian population. At an early 2004 Biddu protest, soldiers unleashed a massive attack, killed two, injured 70 others, some severely, and caused an elderly man to die of a tear gas-induced heart attack. Numerous other demonstrations, then and now, were disproportionately attacked by “massive retaliatory violence” with dozens killed and thousands more injured throughout the West Bank. Prominent activists are targeted for removal, willful disabling, or death. Illegal weapons are used, including bullets that break into pieces on contact leaving shrapnel slivers inside bodies that are very hard or impossible to remove. Besides willful killings, legs are targeted to inflict disabling injuries, including against children. Head shots are also used with rubber bullets and tear gas canisters dangerous enough to cause cranial fractures and permanent memory problems. Ambushes and other surprise attacks are employed using indiscriminate fire with lethal weapons unrelated to crowd or riot control. Indiscriminate attacks also occur that are passed off as unfortunate errors, when, in fact, they’re deliberate, for revenge, and “constitute an integral part of” oppressing popular resistance and right of Palestinians to be free. Innocent civilians are wounded, disabled or killed in cold blood because soldiers are ordered to do it. — fields are set afire, crops and trees uprooted, and land effectively destroyed. — 40 mm high-velocity tear gas rounds that resemble shells and explode internally for added velocity and impact; when fired directly at crowds, they’re like missiles able to cause serious injuries and deaths. Collective punishment includes threats that it will continue as long as demonstrations persist. It also aims to divide communities, families in the interest of their children, hurt economically by destroying property, deny permits to hamper movement, and break the will to resist. — threatening the security of Israel, even though the International Covenant on Civil and Political Rights (ICCPR) affirms that assembling and peaceful protests are lawfully protected activities. Since 1967, however, over 750,000 Palestinians (as much as 40% of the male population) have been victimized by systematic arrests, detentions and brutalizing treatment in custody. — when used, military tribunals must afford all protections guaranteed under ICCPR’s Article 14 that stipulates: “All persons shall be equal before the courts and tribunals….shall be presumed to be innocent until proved guilty,” shall have a fair and impartial trial, and be granted all rights according to established international law. Israel’s military courts defile all of the above and offer no possibility for justice. Judges are hanging ones. Children as young as 16 are tried as adults. Secret evidence is used, and the right to appeal flawed verdicts and sentences is severely compromised. Israel targets anyone suspected of resisting as well as children for the “crime” of assembly, throwing rocks, or having a family member previously arrested. Popular committee heads are especially sought as a way to remove leaders and weaken movements. A Bil’in village head, Iyad Burnat, was arrested twice – in 2005 when he blocked bulldozers beginning work on a segment of the Wall. He was beaten severely enough to require hospitalization. Then in 2008, he was arrested again during a demonstration, tried and fined. Similar incidents occur regularly in other villages. Youths are frequently targeted because they’re among the staunchest and most proactive demonstrators, yet more vulnerable, less aware of their rights, and as a way to intimidate parents. At times, military raids provoke them to react and crack down hard indiscriminately when they do. During arrests, violence is standard practice. Samed Mohammad Hassn Salim’s experience was typical. On February 18, 2009 in Jayyus, he and 60 others were arrested for participating in a weekly protest against the Wall. His pregnant wife was thrown to the ground and later suffered a miscarriage. A medical report confirmed it resulted from the fall and sound grenades used in the assault. Those in detention face intimidation, humiliation, threats of recriminations against family members, long interrogations, physical and psychological torture and abuse, demands to sign confessions and provide information on other protesters, denial of medical care, poor sanitary and hygiene conditions, inadequate quantity and poor quality of food and water, and exposure to the elements. At times, treatment is severe enough to leave permanent psychological and/or physical scars. Detainees are forced to sign confessions in Hebrew they don’t understand, confess to crimes, and deny they were tortured. Nonetheless, one military commander said that for every 1000 detainees, only one will provide information, and even that might prove useless. Palestinian human rights activists are generally treated harshest of all, including severe treatment and longer sentences for resisting repression and standing up for their rights that include peaceful demonstrations and displaying the Palestinian flag. Israel and international activists face far different treatment under Israel’s judicial standards. In detention, they’re generally treated humanely, endure no long interrogations as a rule, most often are released in a few hours, may or may not face charges, but if so are tried in civil courts under a completely different system of justice. Acquittals are more common, fines lower, first offenses forgiven, if sentences are imposed they’re for much shorter periods, and the right of appeal is assured. In the first seven months of 2009, 129 Israeli activists were indicted, 15 convicted, and the majority got suspended sentences or convictions reversed on appeal. Deportation was how most internationals were handled. “To date, there have been no reported cases of an Israeli or international activist serving more than a week in prison, or being placed in administrative detention,” and most are rarely sentenced. Currently, no international activists are in prison for having participated in an anti-Wall protest. In contrast, Palestinians charged with throwing stones face up to 20 years in prison although generally they’re released within a year. Under ICCPR’s Article 14, fair, impartial trials are guaranteed. Under the UN Congress on the Prevention of Crime and the Treatment of Offenders, Basic Principles on the Role of Lawyers, access to competent counsel must be granted within 48 hours. Adequate time and facilities must be available to communicate privately, and if detainees can’t afford to pay, proper representation must be provided anyway. Nonetheless, Palestinians are affected by factors such as counsel’s citizenship and residency status, as well as military orders, Israeli laws and prison procedures that violate international standards, so their right to fair, impartial justice is impossible. Inflated and multiple charges also assure convictions on at least one offense regardless of the validity of evidence. The result is less than 1% acquittals as explained above and 97% resolutions by plea bargain agreements for the most leniency lawyers can get. “The evidence used against people is never verified, for instance, all the (Palestinians) who touched the microphone (at a specific protest) were charged with incitement – there was no mention of what they had said” or what, in fact, they incited. “This is a very typical example,” but for Jews it’s entirely opposite. Even when Palestinians can prove their innocence, acquittals are rarely gotten. “I’m against the military courts. Let the occupiers do this job for themselves. Why should lawyers go there and try to do things when we know at the beginning” how things will turn out. From their time of arrest, Palestinians have almost no chance to prevail under a system of kangaroo court justice, so it’s why up to 12,000 languish in Israeli prisons at any time and endure torture and other dehumanizing treatment. Prosecutors did all they could to extend his detention and brought up baseless old charges to delay his trial hearing. Brijiah was luckier than most others who disappear for months or years in Israel’s criminal justice system that affords none of it to Palestinians. No bail, long sentences, high fines, and brutalizing treatment are common, nearly always in violation of international law. For example, under Military Order 378, stone throwing carries a maximum penalty of 20 years imprisonment, and the threshold of evidence to convict on mere suspicion is low enough to prevail. Former soldier, now writer and journalist Seth Freedman says it’s common for the military to select targets, regardless of whether they’re committing the act in question. Then it’s their word against defendants, nearly always they prevail, and many innocent youths are imprisoned for offenses they didn’t commit but have no way to prove it. They can’t prove a negative. Nor can they defend against threats that serve as “a powerful coercive means of intimidating – and harassing – protestors.” In detention, death or physical harm threats are made during interrogations. Also making them against family members is commonplace as a way to induce cooperation. “The army has created a lot of obstacles but it hasn’t prevented the protests.” Those arrested do it again, at times more cautiously, but others with a determination to prevail. The entire judicial process is racially biased and blatantly discriminatory. Indiscriminate arrests are made. Demonstrators are intimidated and targeted. Popular committee leaders and youths are most vulnerable. State terror is common practice, and in detention humiliation, torture and other abuses are employed for extended periods – to break their spirit, crush their will to resist, make them docile and submissive, or simply give up and leave. For over four decades under occupation, Palestinians, on their own, have continued their struggle to live freely on their own land, in their own country as international law affirms. Like people everywhere, Palestinians yearn to live freely on their own land as international law affirms. They deserve universal support for the most fundamental of all rights without which all others are compromised. Stephen Lendman is a Research Associate of the Centre for Research on Globalization. He lives in Chicago and can be reached at [email protected].